Is your deck missing that little something that sets it apart? Is your vinyl deck surface in great condition, but your railings are not up to par? Or, do you need to make improvements to increase the safety of your deck? Perhaps it’s time to update to vinyl deck railings to complement your home. Tuff Industries explores the various types of deck railings to find out why vinyl deck railings are such a popular choice. Iron-based railings look great and come in a ton of interesting styles, but they come with a few drawbacks. For one, they are a fair amount more expensive than other alternatives. They also may rust over time (which could stain a vinyl deck surface) and require regular maintenance to restore. For older decks, iron railings add a fair amount of weight, which means you will want to have your vinyl deck inspected to ensure that it can handle the additional load safely. While wood is certainly less expensive than iron, it also has a lifespan of only 10 to 15 years. If you are installing a new vinyl deck membrane, the deck surface will likely last longer than your railings, which could present a problem should you require a change later on. You’ll have to maintain your wood railings every few years by sealing or painting to keep them from absorbing water. Generally, composite railings come in a variety of parts which makes for a longer installation process. If you’re not a handyman, this may require a professional to install your deck railings over a vinyl deck surface. Composite railings come in a range of colour and styles, but not as much as a range as some other products. The more budget-friendly composite railings tend to cost as much as a higher-end vinyl deck railing and may not look as nice. Offering a variety of choice, easy installation and maintenance, as well as affordability – it’s not hard to see why so many new decks are taking advantage of the benefits of vinyl deck railings. Vinyl railings can be easily washed, don’t fade, peel, or crack, and last many years longer than traditional wood railings, while offering a budget-conscious solution. Additionally, vinyl deck railings look great with a vinyl membrane, and the two together help to protect your deck. Combining vinyl posts with vinyl spindles offer a contemporary design – but that’s not the only option for vinyl deck railings. You can use vinyl posts with glass panels for a more modern feel, as well as enjoying your view. The variety of colours and textures of vinyl deck railings also allow you to capture the look of granite or stone, without the cost. 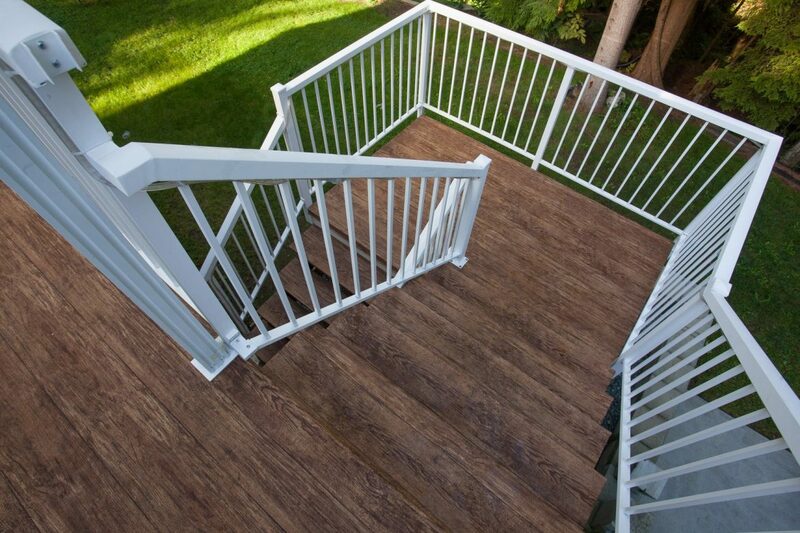 Because it’s prefabricated, vinyl deck railings are easy to install, making them a favourite choice for contractors. Once installed, the railings are good to go – no need for sealing or painting. Each year you can quickly clean vinyl deck railings with a hose or some soap and water.